Esplora Sintra e Cascais con una guida locale che condivide le principali attrazioni e le attrazioni nascoste in queste due imperdibili città vicino a Lisbona. 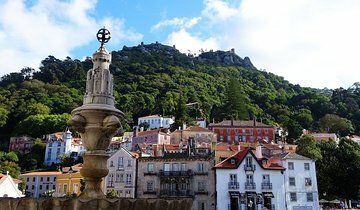 Il tour di un'intera giornata inizia con il trasferimento in hotel a Lisbona e in un viaggio panoramico fino a Sintra. Visita la Quinta da Regaleira, uno dei siti patrimonio mondiale dell'UNESCO di Sintra, quindi prendi il tempo per il pranzo. Continua il tuo viaggio attraverso Cabo da Roca (Capo Roca), il confine più occidentale del continente europeo. Infine, dirigetevi verso le città costiere di Cascais ed Estoril per godervi l'incantevole atmosfera e la spiaggia. Well, shortly after we left Lisbon our van was in an accident, while it was minor,we were delayed.Our guide had a rather difficult time as she had to give her comments in four different languages, English being her least proficient. As the tour began, she spoke in length in the other 3 languages and rather briefly in English. As soon as we had finished our tour of the Pena Palace we were dropped off in town and told to walk around,have lunch and possibly go to the museum. This was at approximately 11:40am.She then left the tour and told us to be back at 2pm for the afternoon portion of the tour - which gave us MORE than enough time to do these things.Everyone came to the pre-arranged meeting spot early and waited until 2:20pm when another women came to do the rest of the tour. It was O.K., but again English was a difficulty for her as well. It turned out to be a very long day- rather needlessly due to the overly long wait we all had after lunch. Great tour, exactly what the description says and exactly what we wanted. Our guide picked us up promptly from our hotel, and was absolutely wonderful throughout the day. We got lots of background info, which was great for our first trip to Portugal. The van was perfect for our group and very comfortable. At each stop we had plenty of time to walk around, as well as a lot of guidance as to what would be best to see. Sintra is beautiful, and this was perfect way to see it! Excellent day trip full of activities, our driver / guide is friendly and knowledgeable. We had a great tour guide and only the three of us on the tour. The guide took us to places that we never would have found on our own. He spoke pretty good English so it was easy to chat with him about a variety of subjects. I would have given the tour 5 stars except that not all of the entrance fees were included contrary to what the discription of the tour says.